Scrumptious! All right. Enough with the alliteration. Let’s get down to business. This recipe was inspired by one of my favorite chefs, Mykl Wu. He alerted me to furikake, which was initially created to provide rice balls with a boost of umami, but it can be used anywhere you want to add salty/sweet/seafood-y flavor. How could I say “no” to furikake after that endorsement? I got nori komi furikake at Mykl’s suggestion. Cook soba or rice noodles according to directions on package. Drain and add to large bowl. Add prepared carrots, zucchini, onions, and other desired vegetables. Add vinegar, sesame oil, soy sauce, lemon juice, and Furikake. Mix well, add more seasoning to taste. Top with avocado and nuts just before serving. The julienned vegetables give the dish excellent texture and crunch. Don’t know how to julienne? Me neither. I used a julienne tool on the zucchini and bought the carrots shredded. But I want to learn how to julienne, and Good Housekeeping makes it look so easy in this tutorial. 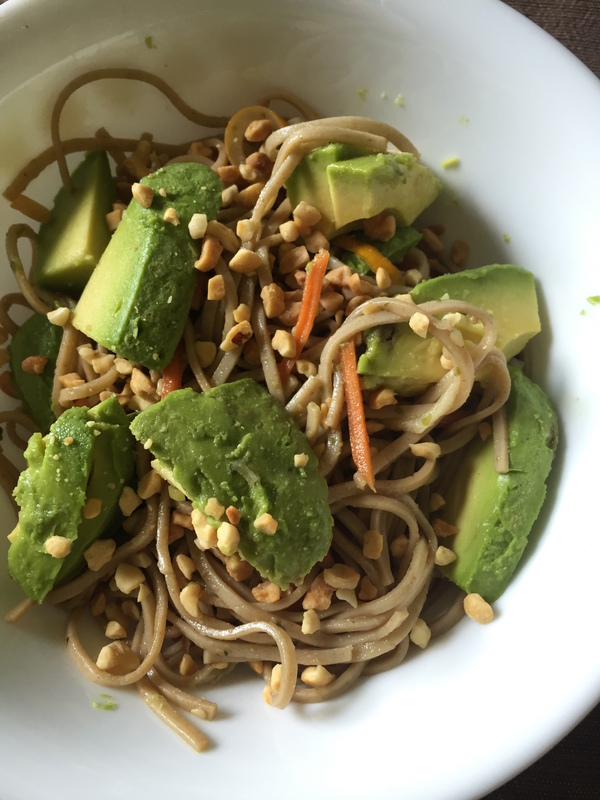 What’s your favorite cold noodle salad?